Digit All Systems organized the first Computers for Guns in the USA for Baltimore City on 13 July 2013 Founded by Lance Lucas, Digit All Systems, Inc. (DAS) is a 501(c)(3) non-profit organization committed to bridge the digital divide and bring the benefits of expanding the technology to everyone. Founded in September 1998, the organization has served more than 25,000 clients. Digit All Systems has donated over 16,000 computers to churches, community groups, and schools in the Miami, New Orleans, and Baltimore/Washington DC Metropolitan area. 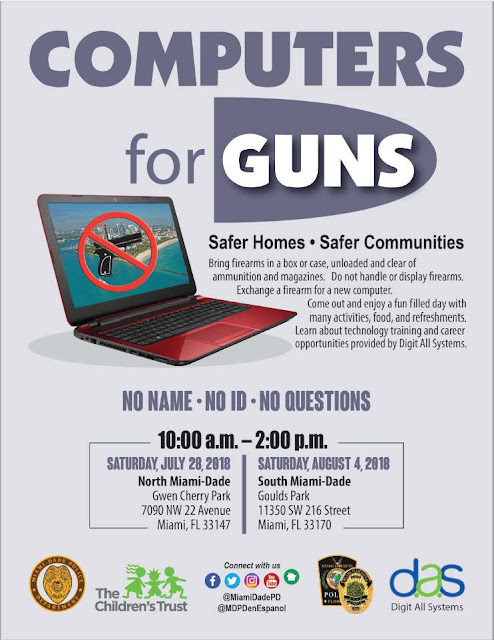 In 2018 Digit All will sign students up at Computers for Guns event and train Miami-Dade community members in computer basics and Cyber Security Certifications under their Cyber Warrior Community Program following the event.